I was at the library, perusing the "new in YA" shelf and saw Bruiser. Having read and loved, loved, loved Neal Shusterman's Unwind (see my review here), I decided to give Bruiser a try, despite being completely underwhelmed by the summary. First off, two of the main character's names are Tennyson and Bronte. Yes, seriously. They are brother and sister and have college professors for parents. The second thing that bothered me about the summary was that it sounded like Brewster is violent with Bronte. I was thinking domestic violence after reading the summary, which is not what this book is about. Bronte befriends Brewster, who is a loner. Tennyson soon joins in on the friendship and things get weird from there. By weird, I mean really interesting and unique. Bruiser is written from four points of view, with the narration alternating between Tennyson, Bronte, Brewster, and Brewster's little brother Cody. Alternating POV's can get choppy are not something that I usually like; however, it works here. 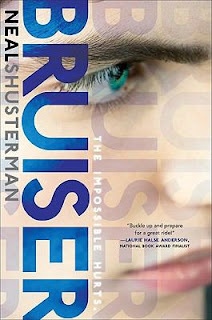 As with Unwind, Shusterman has a unique premise, lots of emotion, a plot full of twists and turns, character growth, and a surprising ending. The pacing was excellent, and I had a really hard time putting this book down. The alternating POV's made the book read really quickly. The reader is in on Brewster's secret before any of the other characters---I love it when that happens! Many of Brewster's chapters are written in prose. I am no lover of poetry---it's usually way over my head and I don't read to enlighten myself, I read to be entertained---but Brewster's poetry chapters added a lot of depth to the story, which I really enjoyed. I would recommend Bruiser to fans of YA, especially fans of contemporary YA. I absolutely loved it and look forward to reading more from Neal Shusterman! adding this book also to my reading pile. This one sounds really interesting and I've really enjoyed what I've read by Shusterman thus far. I shall have to look into this! I've had this one on my TBR list for quite some time. I'll need to move it up a bit. Thanks for the review! Sounds interesting! I'll have to check this one out. i loved the book but what is the setting of the book? i loved the book and read it in only 1 night! i read this as a read aloud in school and its was amazing and so tense.i loved it and my teacher made sure to keep it tense because he stoped at all the good parts.